TSPSC ASO posts 2018 Recruitment, Apply Online upto 2nd July 2018, TSPSC ASOs Recruitment 2018: Telangana Current Notification for ASO Vacancies 2018. The Telangana State Public Service Commission has released a notification for the recruitment of 474 ASO/MP&SO Posts and Applications are invited Online from qualified candidates through the proforma Application to be made available on Commission’s WEBSITE (www.tspsc.gov.in) to the post of Assistant Statistical Officer in Director, Directorate of Economics and Statistics Subordinate Services Department in the State of Telangana. TSPSC invites the applications from the eligible candidates to fill Assistant Statistical Officer in Director, Directorate of Economics and Statistics Subordinate Services Department in the State of Telangana. Candidates can apply from 08th June 2018 to 02nd July 2018. Other details like age limit, vacancy details, educational qualification, application fee, how to apply, selection process, important dates for TSPSC ASO Recruitment 2018 , TSPSC ASOs Online application form, How to apply for TSPSC ASOs Recruitment, Last date to apply for ASOs, Application fee, Eligibility Criteria, ASOs Hall tickets download date, ASOs Results date and more details are time to time available at tspsc website. (18-44*) Minimum 18 years & Maximum 44* years. The age is reckoned as on 01/07/2018 (Rule- 12(1)(a)(v) of State and Subordinate Service Rules). Applicants must possess the qualifications from a recognized University/ Institution as detailed below or equivalent thereto, as specified in the relevant Service Rules, indented by the Department as on the Date of Notification. 5. Bachelor’s Degree with Computer Science (with Statistics as a paper in one year or two years or all the three years as the case may be) as one of the main subjects. from a University established or incorporated by or under a Central Act or State Act, or such Institutions declared as deemed to be Universities under Section 3 of the University Grants Commission Act, 1956 or a foreign University approved by the Central Government from time to time. (Remittance of Fee) Each applicant must pay Rs. 200/- (RUPEES TWO HUNDRED ONLY) towards Online Application Processing Fee. This apart, the applicants have to pay RS. 80/- (RUPEES EIGHTY ONLY) towards Examination Fee. However, the following category of candidates belonging to Telangana State only are exempted from payment of Examination fee. a) SC, ST, BC, PH and Ex-service men. Failure to pay the examination fee, application fee, wherever applicable will entail total rejection of application. The list of Banks providing service for the purpose of online remittance of fee is given in ANNEXURE – II. ii. Last date for submission of ONLINE applications Dt. 02/07/2018. The payment of Fee will not be accepted after 11:59 P.M of last date for submission. 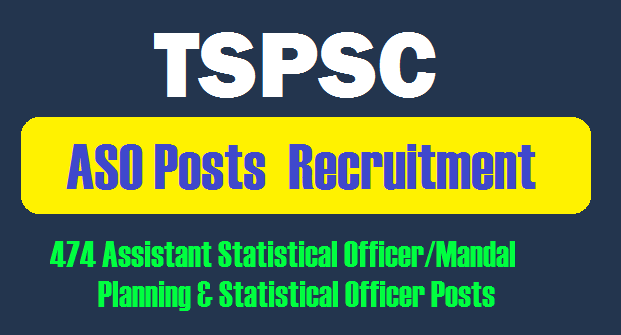 TSPSC invites the applications from the eligible candidates to fill Assistant Statistical Officer in Director, Directorate of Economics and Statistics Subordinate Services Department in the State of Telangana. Candidates can apply from 08th June 2018 to 02nd July 2018. Other details like age limit, vacancy details, educational qualification, application fee, how to apply, selection process, important dates for TSPSC ASO Recruitment 2018 given in this page.